Whoa. I was just reviewing the tape I acquired through shady underground connections. I don't know how I missed it the first time I watched, but things are getting worse. And Javale McGee is just smiling it up in the background. This is getting scary, guys. 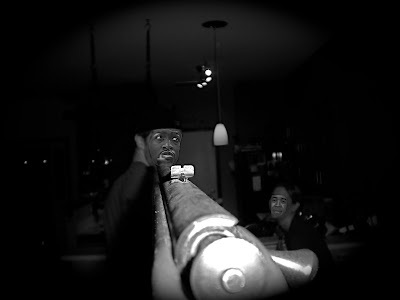 I never took Javaris Crittenton to be a 'point a gun at a teammate' type, but apparently he is that type. There's an old saying that goes, "You just never know with guys named Javaris." That seems applicable here. He's also not great at insults because "I'll shoot you in your surgically repaired knee" is pretty wackintosh.